Q: Regarding the end to US sanctions waivers on imports of Iranian oil, will China stop its purchases of Iranian oil or will you continue to import? Which country do you consider as alternative source of crude if necessary? A: I answered similar questions several times yesterday. Here I'd like to repeat my answer that China firmly opposes the unilateral sanctions and so-called "long-arm jurisdictions" imposed by the US. The normal cooperation under the international law between Iran and other members of the international community, China included, is legitimate and lawful; thus it must be respected and protected. We urge the US to earnestly respect China's interests and concerns, and refrain from taking wrong moves that will undermine our interests. We will continue to safeguard the lawful and legitimate rights and interests of Chinese businesses. Q: We noted that the Belt and Road Portal website and the official website of the Second Belt and Road Forum for International Cooperation both released a report by the BRF Advisory Council. Could you give us more details? A: As part of the efforts to implement the outcomes of the first BRF, the Advisory Council of the Belt and Road Forum for International Cooperation was established in 2018, and its members include former political leaders of relevant countries, and global eminent persons from international organizations, the business community and academia. The Advisory Council held its first meeting in Beijing in December 2018, during which it decided to draft a report on policy recommendations and deliver it to the forum's preparatory committee. According to the writers of the report, Shamshad Akhtar, former Executive Secretary of the Economic and Social Commission for Asia and the Pacific of the United Nations, and Lin Yifu, former Vice-President of the World Bank and Honorary Dean at the National School of Development, Peking University, the report studied the positive role of the BRI cooperation in improving interconnectivity, promoting world economic growth and implementing the 2030 Agenda for Sustainable Development based on what was discussed in the first meeting of the Advisory Committee and the progress made in the BRI cooperation. 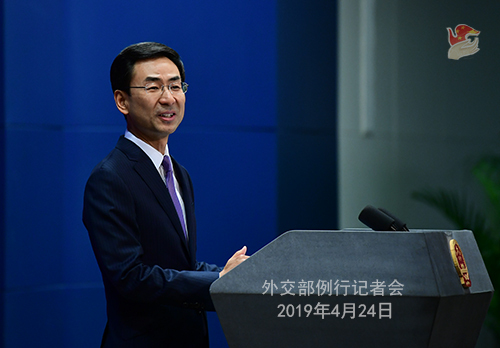 It also explored key areas and directions for future BRI cooperation and gave policy recommendations on upholding multilateralism, fostering an open world economy, improving soft connectivity alongside hard infrastructure, better branding the Belt and Road, stepping up the mechanism building of the BRF and other efforts. Details of the report are readily available online. Here we'd like to thank the Advisory Committee for all its hard work. We will earnestly study the recommendations offered in the report and work with all parties for steady and sustained progress in deeper, more substantive BRF cooperation. Q: The international community is following the upcoming summit between the DPRK and Russia. According to latest news, the train carrying the DPRK leader Kim Jong Un has entered Russia's territory. Chairman Kim will reportedly exchange views with President Putin on bilateral relations and the Korean Peninsula issue. This is said to be the first meeting between the two leaders. How do you think of the interactions between the DPRK and Russia? A: The DPRK and Russia are both China's friendly neighbors. We are pleased to see that they step up high-level exchange and bilateral cooperation, which we believe is conducive to the further development of DPRK-Russia relations and peace and stability on the Peninsula. We wish this summit a success that will contribute to the settlement of the Peninsula issue. 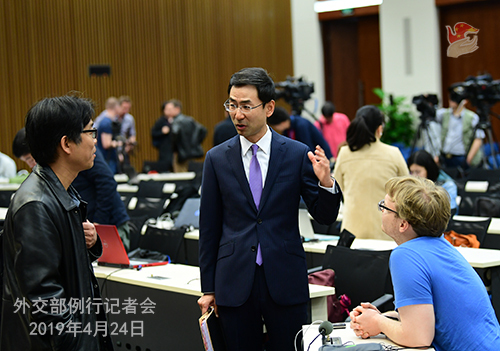 As close neighbors of the Korean Peninsula and permanent members of the UN Security Council, China and Russia have all along maintained close communication and coordination on the Peninsula issue. We have made a lot of joint efforts for peace and stability on the Peninsula and formulated a road map for the political settlement of the issue. The situation on the Peninsula is now showing a positive momentum for dialogue and deescalation. China stands ready to work with all parties, including Russia, to take phased and synchronized steps as part of a package plan, and continue to advance denuclearization and political settlement for more positive outcomes. 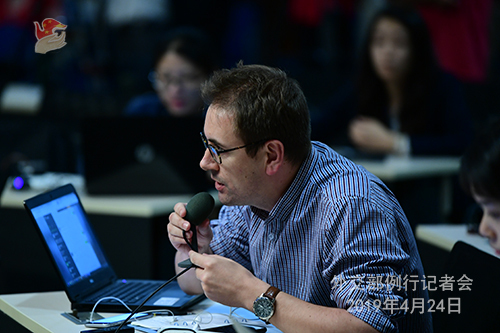 Q: British media say that Prime Minister Theresa May has ordered Huawei be banned from supplying core parts of the future 5G mobile phone network in Britain. However, Huawei will be allowed to supply some non-core technology to UK phone companies. Does the Chinese government have a view on this decision? Is China concerned that a similar decision may be taken by other governments if they haven't taken such a decision already? A: We just heard this from the news and are still learning more about it. China's position on this issue is clear and firm. We support Huawei and other Chinese companies in their normal economic and trade cooperation with other countries following international rules and market principles. During this process, we ask our companies to abide by local laws and regulations, and hope the relevant countries can provide a fair, just and non-discriminatory business environment for Chinese companies, Huawei included, so as to achieve win-win outcomes. Q: Yesterday I asked you for some details on the trade talks between the US and China. You said we should ask the relevant department. Now the relevant department has announced that its press conference tomorrow is canceled. So I was wondering if you could enlighten us on some details about the talks? A: As you are asking for the specifics, I'd still refer you to the competent authority of the Chinese side for more information. What I can tell you here is that substantive progress has been made in the high-level economic and trade consultations between China and the US. We are keeping in contact with each other. 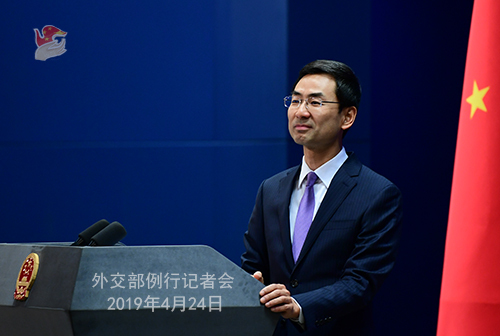 Following the important consensus reached by our leaders, the Chinese and US teams, as we believe, will continue to meet each other halfway and work together for a mutually beneficial agreement. Q: Another question on Iran. You reiterated that China's "lawful and legitimate" rights and interests must be respected. Now if the decision is followed through by the US, does China consider that it means China's lawful and legitimate rights and interests are not being respected? And if so, will China take retaliatory measures? Or will China buy oil from elsewhere? Is China concerned about a similar sort of Meng Wanzhou type incident occurring again? A: Your question is a thorough one. But I cannot answer a hypothetical question because for now I do not foresee how the situation will evolve. One thing is clear: the normal cooperation between China and Iran is legitimate and lawful; thus it must be respected and safeguarded. We urge the US to refrain from undermining China's rights and interests, and we will continue to safeguard the lawful and legitimate rights and interests of Chinese businesses. Q: With regard to the "Occupy Central" trial in a Hong Kong court, the US Consul General in Hong Kong expressed concerns that this would undermine people's basic freedom enshrined in the Basic Law of the Hong Kong SAR. I wonder if you have any comment? A: Like we said on many previous occasions, since Hong Kong is China's special administrative region, its affairs are entirely our internal affairs. We firmly oppose any foreign interference in our domestic affairs. Q: Russian President Putin reportedly proposed to restart the Six-Party Talks over the Korean Peninsula issue. Will China support this initiative? A: I haven't seen the news you talked about. The Six-Party Talks was initiated and supported by the Chinese side and held for multiple times. It has played a positive and constructive role in promoting denuclearization and deescalation on the Korean Peninsula. Under the current circumstances, we stand ready to work with Russia and other parties to sustain and strengthen the existing momentum for dialogue and deescalation, and continue to advance denuclearization and political settlement on the Peninsula. Q: As far as we know, because of US sanctions on Iran, the Chinese side has warned Chinese companies in Iran, the China-Iran Joint Chamber of Commerce and other institutions about their exposure to the country. Does the foreign ministry have a comment? A: I'm not aware of what you said. The normal cooperation between China and Iran must be respected and protected. Chinese businesses and the normal life and work of Chinese citizens in Iran must be guaranteed, and their lawful rights and interests must be safeguarded.